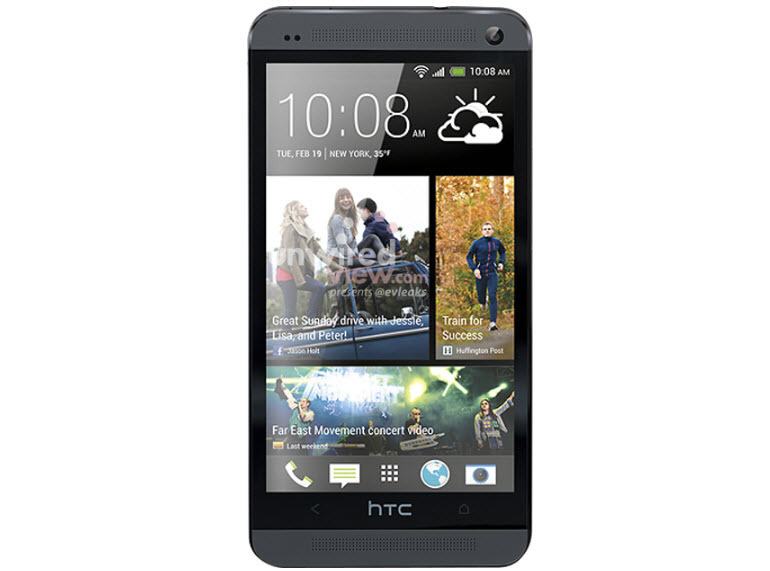 Check out our full review of the HTC One smart phone. The updated HTC One, also known as the M7, will be available for purchase in the U.S. starting March 22. The device will launch simply as the HTC One, available through AT&T, T-Mobile, and Sprint. Verizon will receive the device later, presumably to avoid conflicts with the Droid DNA. The latest information comes form a trusted over at HTC Source. Potential M7 buyers are likely looking at $200 on-contract for the 32GB model. Those with larger media libraries will need to shell out $300 for the 64GB version. The source has also shared that the HTC M7 will feature a metal body, contradicting the previous reports of a soft-touch casing (that was used on a pre-production unit). The HTC M7 will come in two color variations: black and silver/white. It looks like HTC is still searching for a signature look as the HTC M7 changes the company’s design once again, this time adding larger speaker grills to the top and bottom of the smartphone. Fingers crossed that these dual-speakers offer impressive audio, an area mobile devices have yet to crack. The result is a decidedly retro-inspired device that isn’t offensive, but also doesn’t break any new ground. We likened it to the offspring of the BlackBerry Z10 and iPhone 5. But, of course, a smartphone can succeed or fail based on the specs so it’s a good thing the M7 is packing. The star player here is the 4.7-inch display sporting an impressive 468 pixels-per-inch. Under the surface, a 1.7GHz quad-core Snapdragon processor will be powering the taps and swipes, while a 13-megapixel camera is on-board to capture life’s embarrassing moments. You may have noticed a changed interface in the leaked photos as well. That would be the new HTC Sense 5 homescreen. From the @evleaks photos you can see that HTC has introduced Facebook photos to the lockscreen, a feature already available in Windows Phone 8. There are also only two navigational buttons featured, a home and back button. The multitasking button is not pictured at all, leading us to believe HTC may have integrated multitasking into the back button – another feature already present in WP8. If you can’t wait for the official unveiling, HTC has posted some extremely short teaser clips of the M7 behind a ticking countdown at HTC.com. On Feb. 19, HTC will officially unveil the M7.